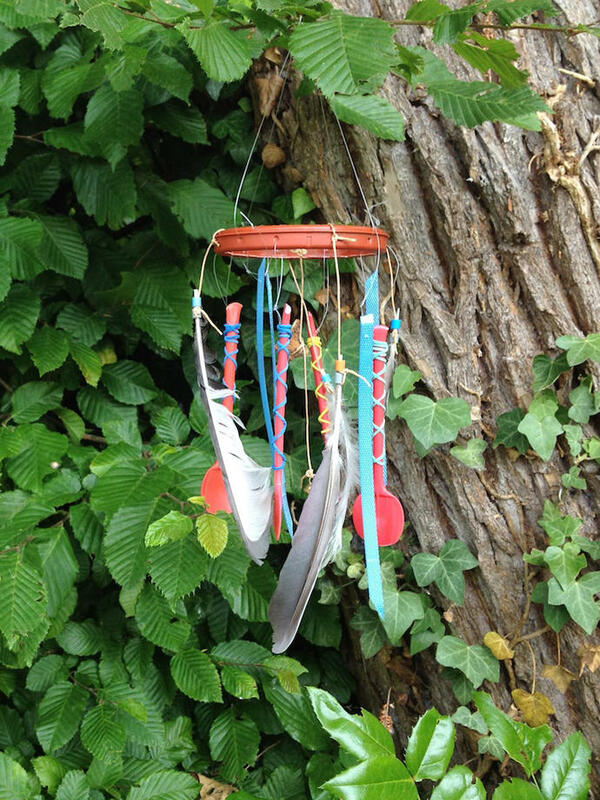 I created these wind chimes using material found on nature walks and the recycling bin. 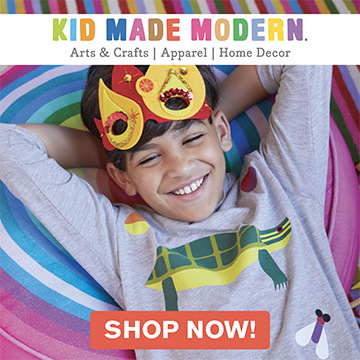 In the beginning, it was a mobile made from ice cream spoons. 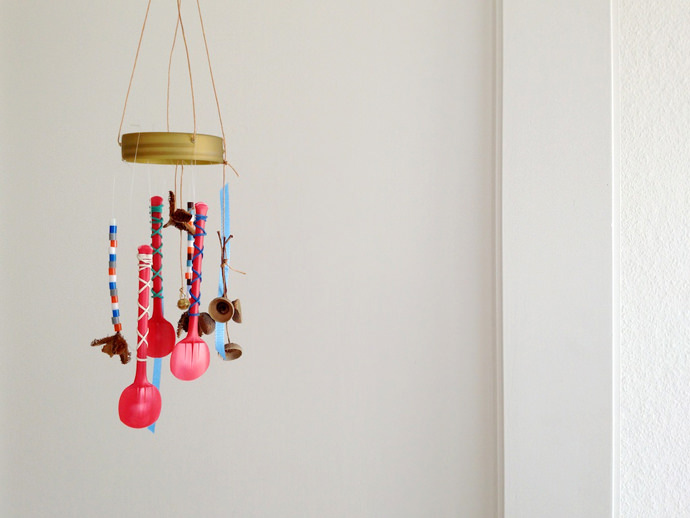 They made a soft sound like small bamboo sticks, so I added a bell and ended up creating a nice little wind chime. Figuring out how to hang the spoons without making a hole led me to the rubber bands and i used it in a decorative way. 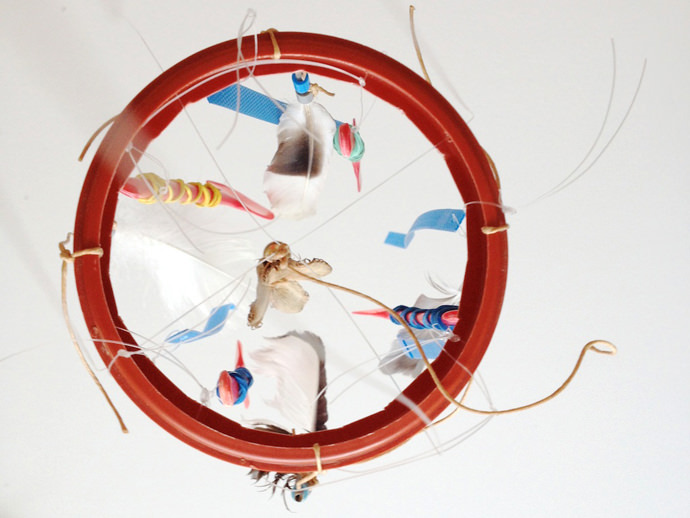 Note: This project is for children 3+. Take care with the craft knife! 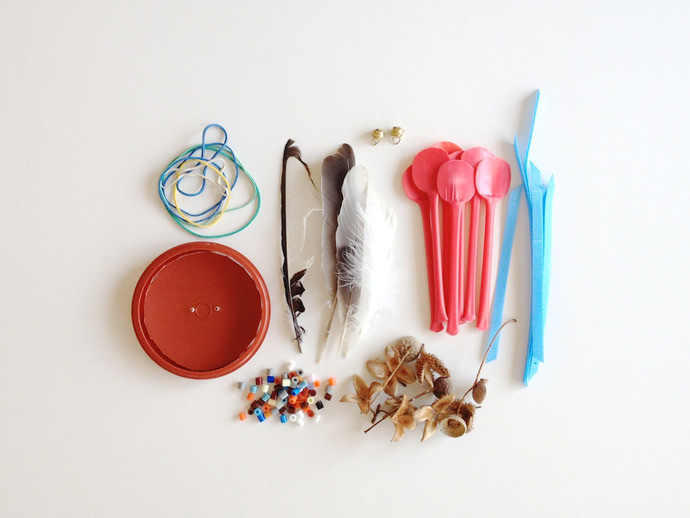 Younger kids can help find the materials. 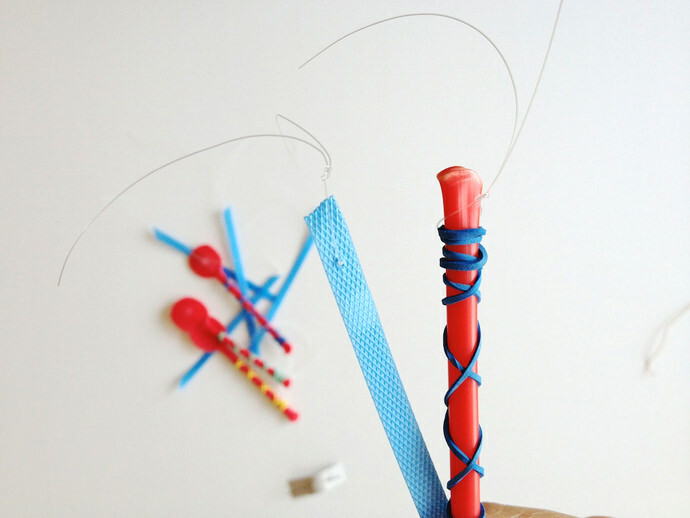 Kids learning to make simple knots will have fun practicing with this simple craft. Cut out the center of lid and punch 12 holes around the outside edge. 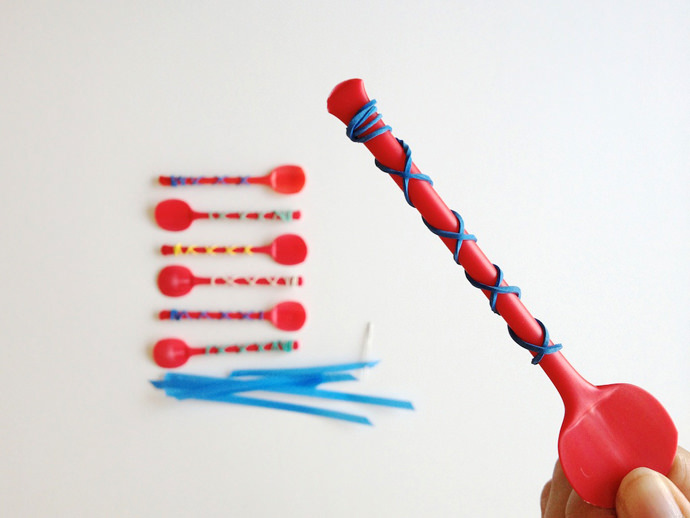 Wrap the spoons with the rubber bands. 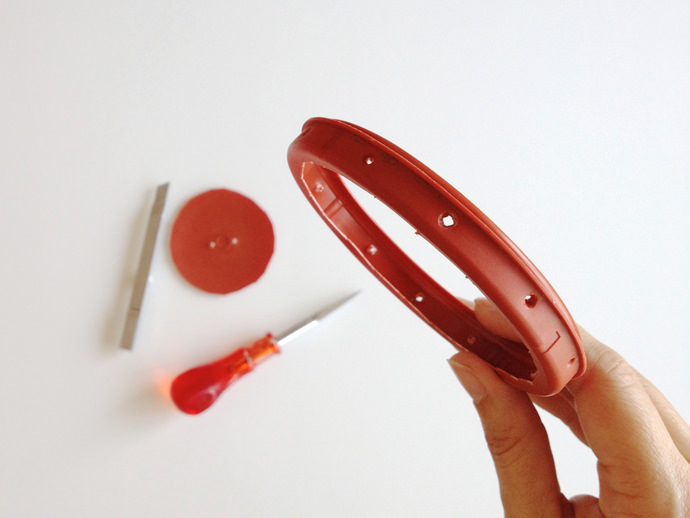 Use the needle to make a hole in the plastic strips. Cut a 7 inch piece of nylon and knot them. Cut some longer nylon (13 inches) and knot it to the beechnut. Thread some hama beads. 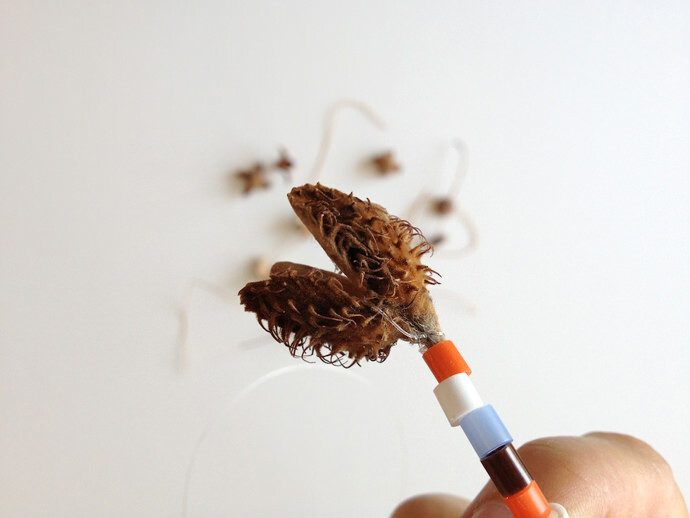 Knot a hama bead with cord and stick a feather in it. Add a second bead to affix it. 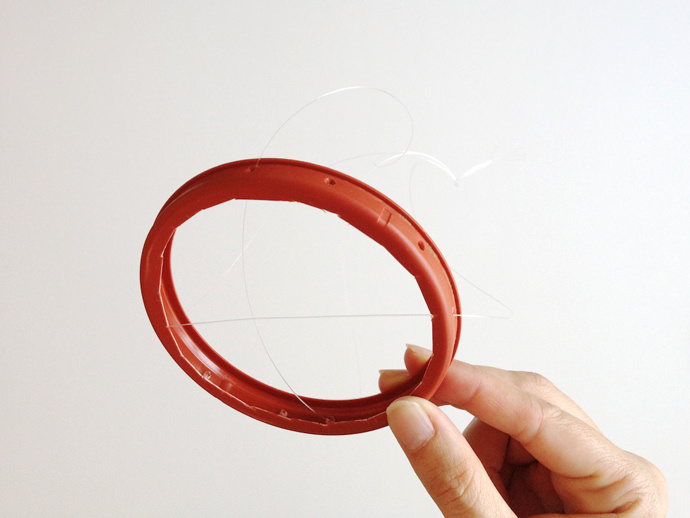 Cut 2 pieces of nylon (18 inches each) and lace them crosswise through 4 holes in the lid. 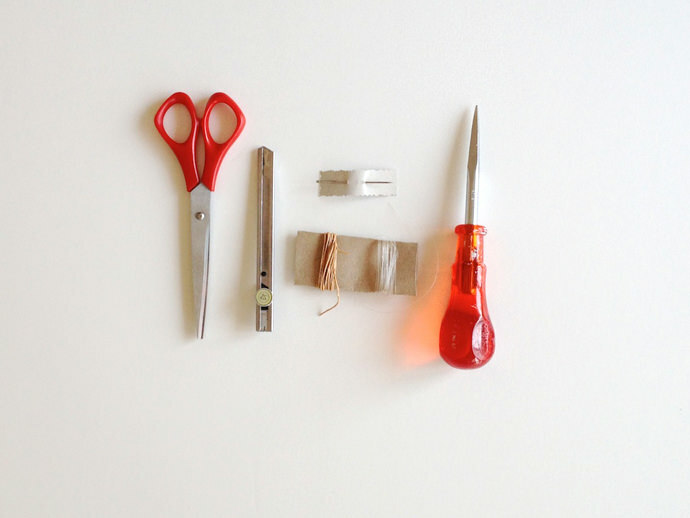 Make a knot at the end of all the pieces of nylon. Now add the spoons, feathers, and plastic strips as you like. Make sure to vary the lengths a bit. The string with the bells should come through the middle. Cut the nylon and cord. 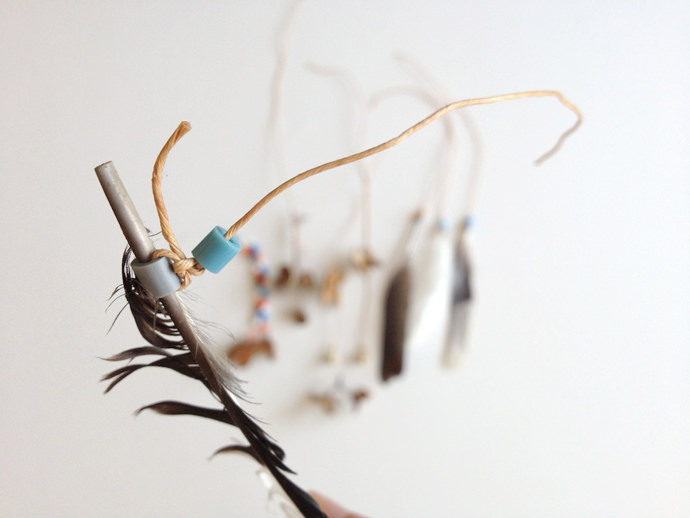 Your wind chimes are ready! 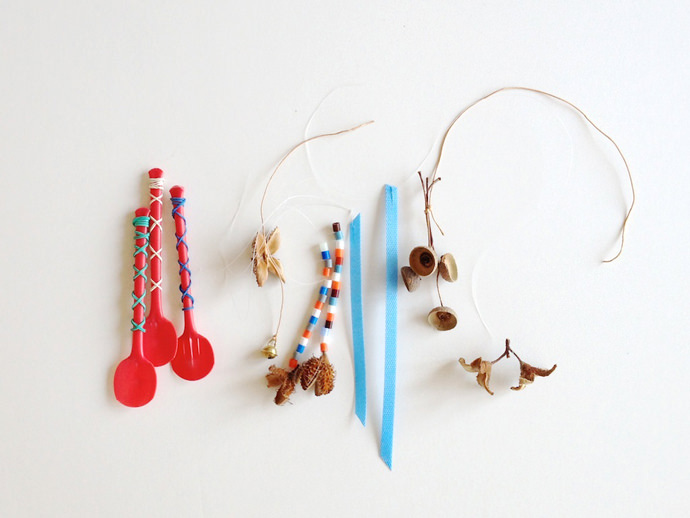 I ended up preparing too much material—enough for a second wind chime! 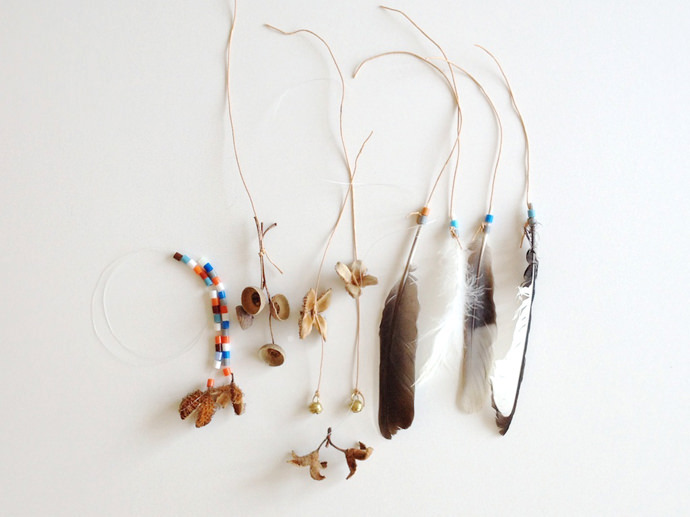 I prepared a second lid and easily made another wind chime. 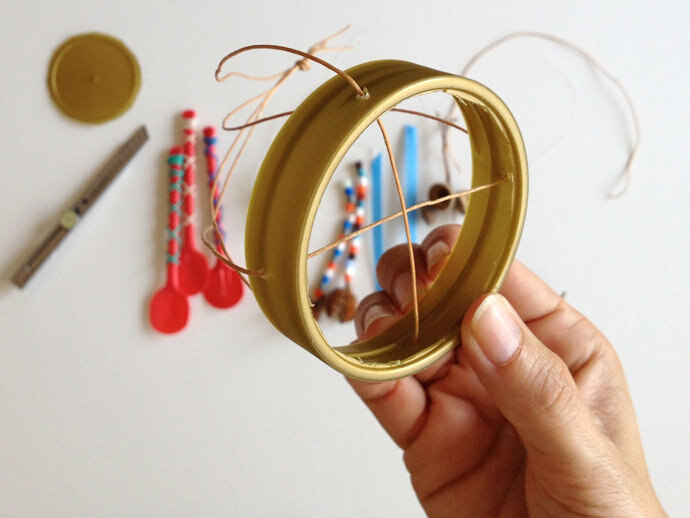 Rubber bands = mind blown. Such a simple solution for the “hole” thing. Now that gives me something to play with! You made it way a way more family friendly project over, say, drilling a hole. This is so cute! 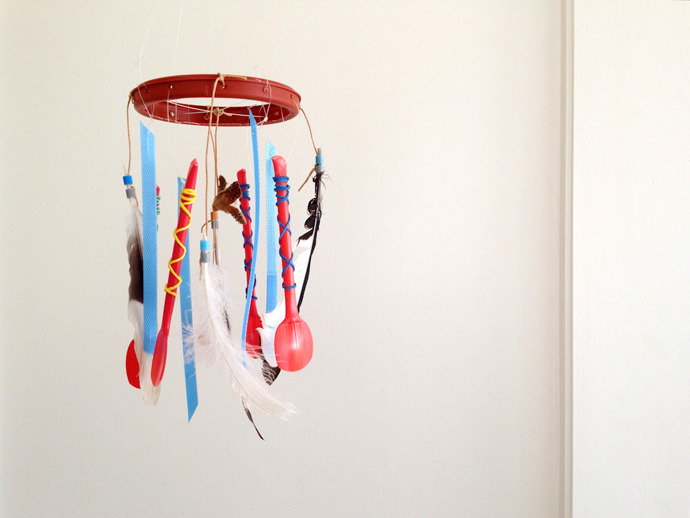 I have been wanting to make my own wind chimes but don’t really have a place to hang it. Now I feel inspired to just make it and find a place to hang it afterwards. :) Thanks for inspiring me. 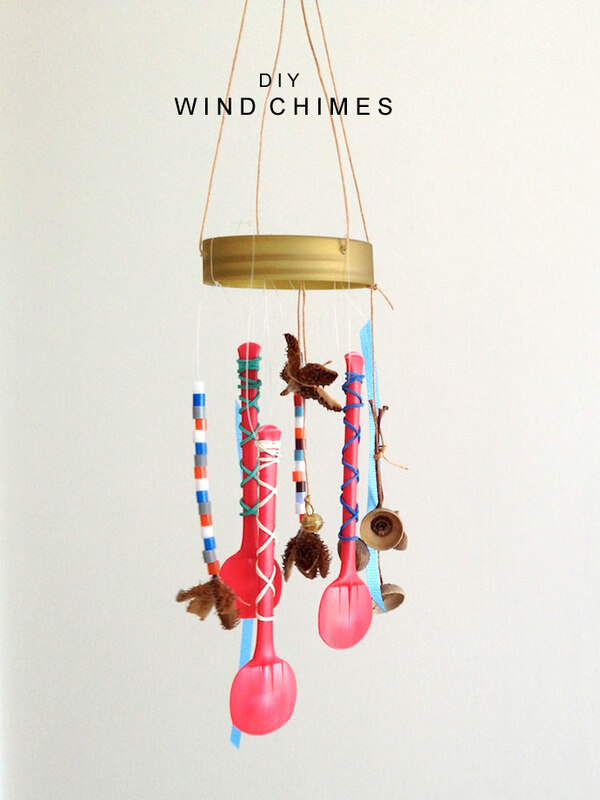 This wind chimes DIY project is just what i am looking for. Think I could handle this.